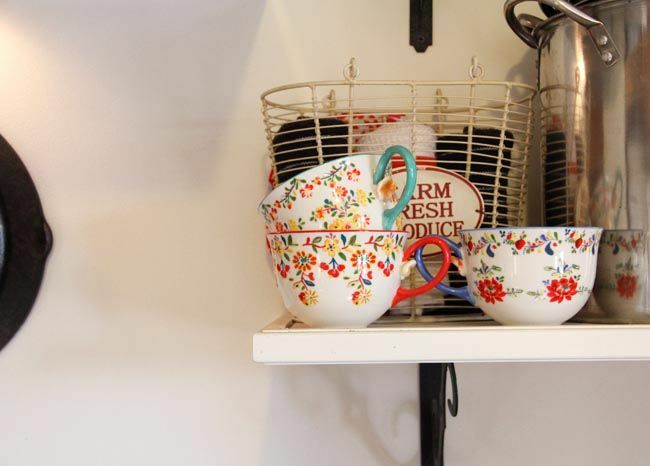 TheRustedChain - The Blog: Thrifty Country kitchen. When we moved out to the country, the first thing we had to do was replace the entire kitchen. We gutted it. Stripped it to nothing. I've looked all over my computer and can't find the before pictures, unfortunately. All I found was this one, and you can see the original flooring and junk. So we redid the entire kitchen, on a dime. When homes have wood trim around the windows, I don't like to use curtains. So our windows are nekkid, other than blinds to block sun. We left all the trim it's original color, and painted the walls a white called "Southern Plantation". There's a little gear sitting on the window that is just something found in the yard. When we moved here The Man worked for a cabinet company. These cabinets were custom made for someone else, but there was a goof on the stain. So we got them for free. Someday I'd like to consider painting them white, but I couldn't argue with an entire kitchen of free custom cabinets! I intentionally put the knobs in an unusual spot just for visual interest. We replaced the flooring by laying tile from Lowe's. When countertop shopping, I wanted something different. Something fun and unusual. We looked into stainless steel but no one around here does them for an affordable price. We talked about concrete but I never could get The Man to commit to that. We ended up finding granite for a steal from a discount granite store. The light above the sink was on clearance for $17 at Lowe's. It was originally Oil Rubbed Bronze color, but I spray painted it with "stainless steel" paint. The wooden sign is something we found in one of our barns. No clue what it is or means but I liked it. 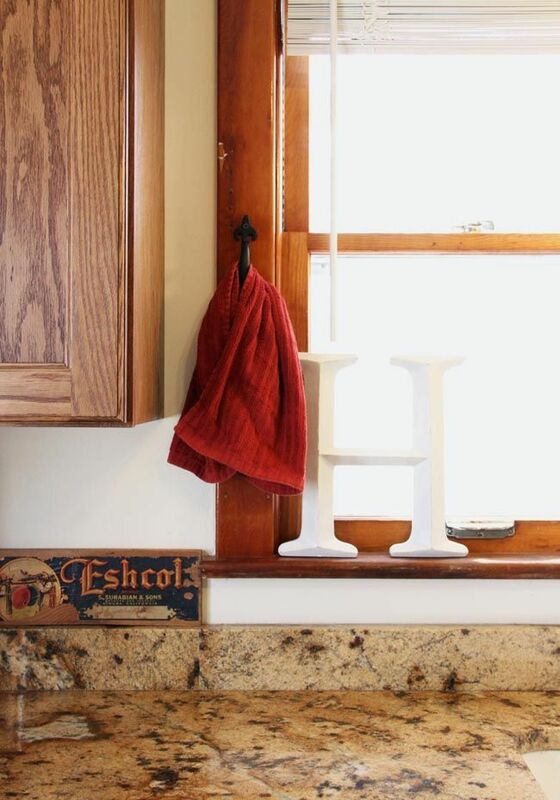 The H is for our last name, bought at Hobby Lobby with a 40% coupon and spray painted white. I put up drawer pulls vertically to hang kitchen towels on either side of the sink. They were hand-me-downs from The Man's grandparents - free. The stove was a floor model and we got a crazy good price on it. It has a double oven, which I adore! The shelves were built specifically to hold my large pots. The little sunflower tin is also from Hobby Lobby with a 40% coupon. 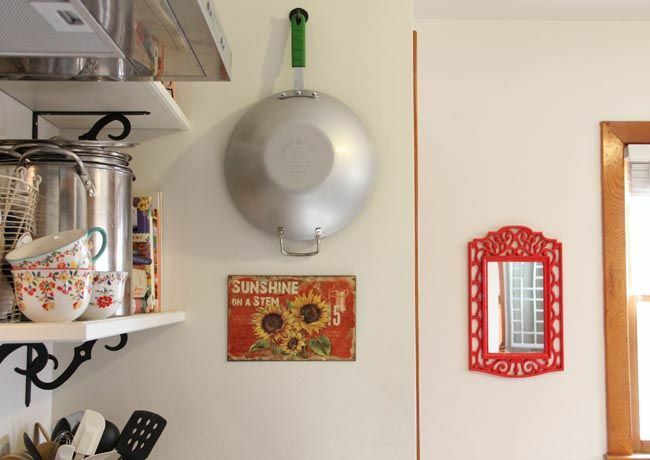 When you're limited on cabinet space, the walls are a great place to hang pots and pans! The red mirror on the wall, was a thrift store find, spray painted. I use it as a display piece at craft shows and the Barn Sales, and I can't tell you how many people have tried to buy it from me! 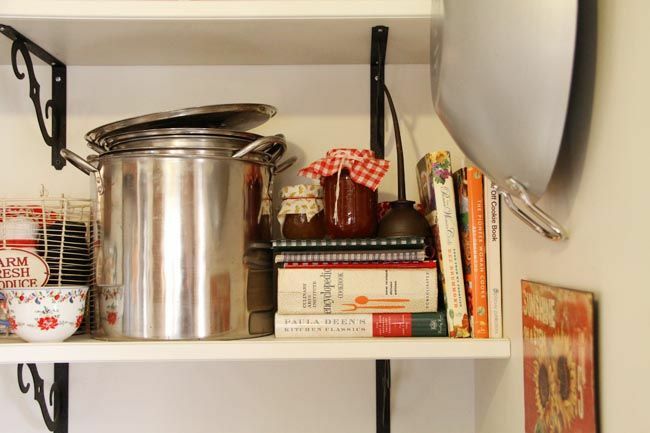 On the shelf, a collection of cookbooks, some homemade jams, and an old oil squirter we found in the yard. Mugs from Anthropologie, a gift from a friend. Vintage fruit bowl, hand-me-down from The Man's grandparents. Overhead light (not seen here) is an affordable fixture from Ikea. I love being able to decorate with "junk" found around the yard, but mixing it in with new things. 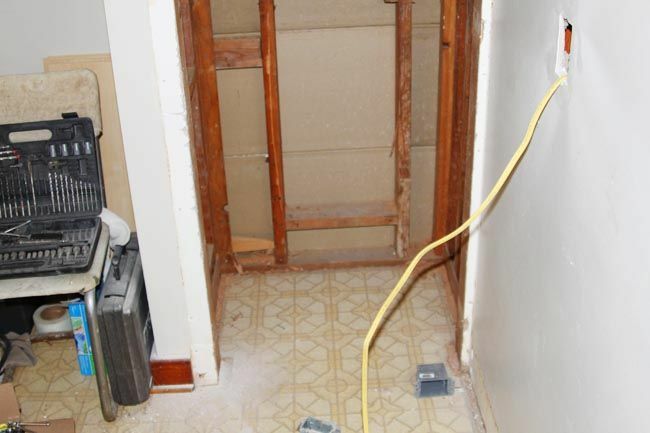 That's how we remodeled our kitchen on a dime! 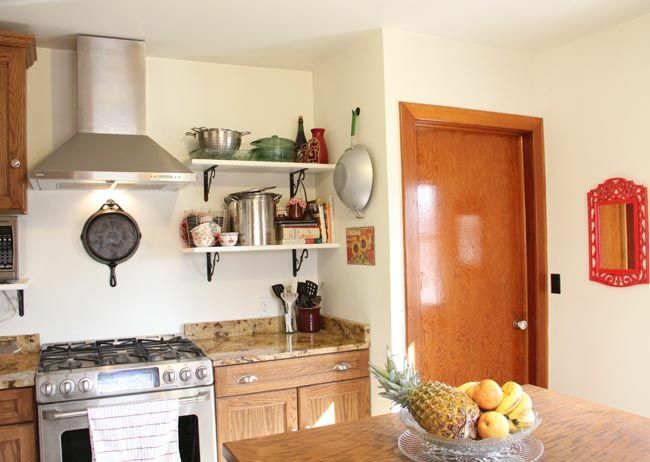 Oh my gosh, I am so in love with your glorious kitchen. 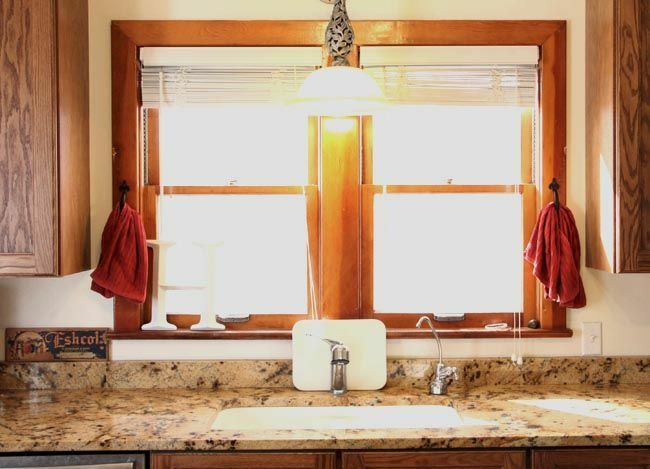 It is beautiful from your little handles transformed into towel holders, to those gorgeous countertops. How beautiful everything looks. Don't you love it when things come together for little to nothing? You have a dream kitchen sweetie. That little red mirror, just screams of love. It is so pretty. The little things always make a room. What a great kitchen. Lots of light, wonderful features and the price is certainly "right"! Thanks for sharing your photos. You're a real inspiration. what a lovely kitchen...functional and easy to clean..lots of light and beautiful! and best of all...the price was right for you! love love love your kitchen! girl. i am IN LOVE with your farm kitchen. great job decorating! 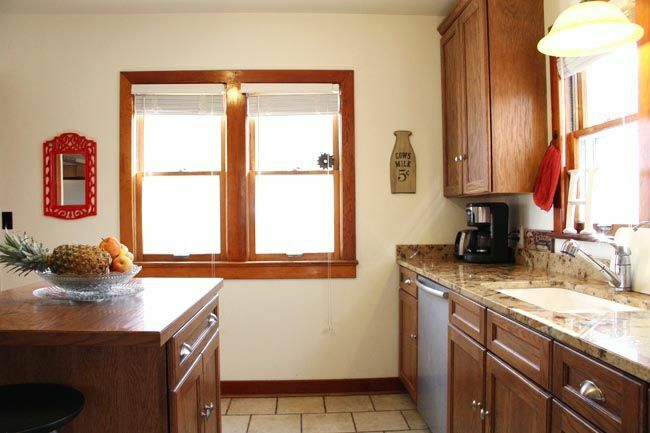 Kitchen looks awesome and you gotta love the price as in cheap! Really like all those unique touches you gave it. Love it! It "fits" your environment :). I have that same Hobby Lobby letter (well, except it's a B, I spray-painted it black and got it 50% off on sale)...great minds think alike, hee hee. Do people really pay full price at Hobby Lobby??? Also love your found objects and heirlooms. I was in your old kitchen...and while I don't remember it looking bad, I don't remember it looking like THIS! beautiful! I dream of a beautiful kitchen....some day, maybe....or not....but I have yours to look at, at least. and I have those anthro mugs too...well...I have ONE...also from a friend...I keep my make up brushes in it...too afraid to use it! Your kitchen is so welcoming! So comfortable- I'd love to visit you and drink loads of coffee together. 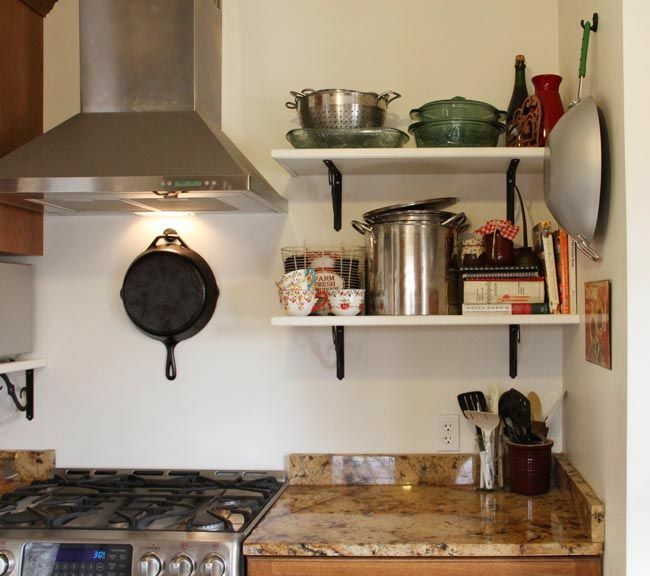 I really like the open shelving near the stove, with all the bright pops of color. The anthro mugs and iron skillet = "farmhouse chic" :) I would never have had the self control to let the beautiful trim on the windows carry them without mistreatments, but it looks great! Looks great. It's great to be able to decorate on a dime!